A little frog was hopping around the farmyard looking for good things to eat. He found wonderfully juicy flies buzzing around the pig pen. "Gulp! Gulp!" Gone. He ate some delicious crunchy spiders that hung from webs behind the feed trough. "Gulp! Gulp!" Gone. He saw a mosquito flying by and reached out with his long sticky tongue and grabbed it. "Slurp," went his tongue. "Gulp! Gulp!"? Gone. As the little frog ate, he explored new places. He saw a cricket hop into the milk shed. The cricket hopped through the door. So, the frog hopped through the door. The cricket hopped up onto the milk stool. So, the frog hopped up onto the milk stool. The cricket hopped up to the table top, and the frog hopped up to the table top. The cricket hopped to the window ledge, and the frog hopped to the window ledge. The cricket hopped out the window. But the frog fell, "SPLASH!" right into the milk pail. The pail was filled half way with fresh milk. 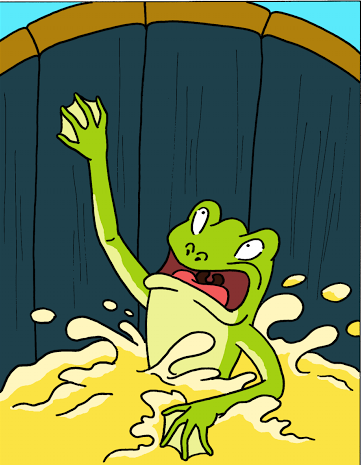 The level of the milk was too low for the frog to reach the top of the pail. The sides of the pail were high, and he could not climb out. The frog kicked, and he swam in circles until he became tired. He tried to close his eyes just to rest for a few seconds, but he sank to the bottom of the pail where his nostrils filled with milk. He could not breathe. Don't give until you're done. Don't give up until you've won.